Since late March 2015, the Antwerp Grand Place offers a remarkable sight to the thousands of tourists passing to admire the city hall and the monumental fountain in front of it: dozens of Individual citizens stand there seemingly alone, several meters separating each from the other. They carry no slogans or banners, rarely even emblems of parties or organizations. There is no shouting or chanting, no fists in the air. Some are quietly reading a book, others chat with bystanders or plainclothes police officers. For this is a protest action called “the upstanding citizen”. 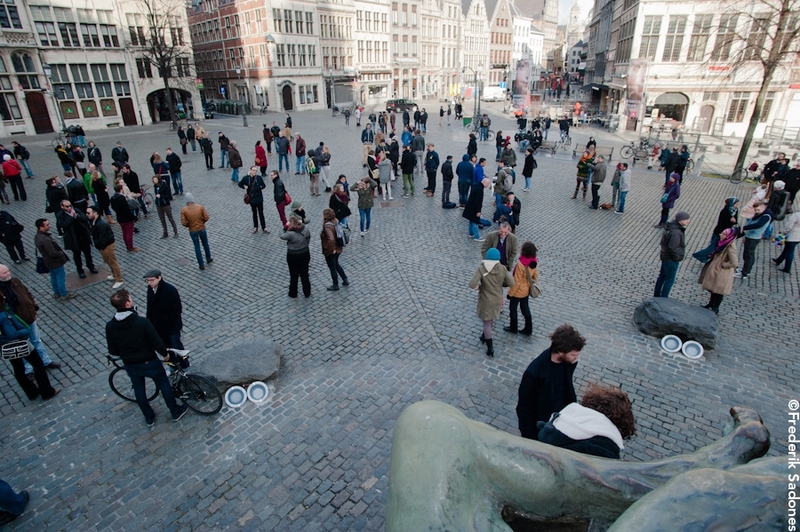 It started as an individual initiative after an unauthorized sit-in there, protesting against racist remarks by the Antwerp Mayor, resulted in the mass arrest of over 200 people and the prohibition of follow-up protests. The City’s rules only allow demonstrations that have been approved by the Mayor; they define a demonstration as something that happens in a group, and the latter is defined as several people doing things “together”. “The upstanding citizen” mode avoids all of those: while the action is obviously collective, people are not acting collectively – they define the spatial and activity template that defines a “demonstration” by avoiding the proximity rules and recognizably joint activity modes defining collective behavior – shouting, chanting, jointly making symbolic gestures. Much to the frustration of the Mayor and his senior police officers, “the upstanding citizens” appear at irregular intervals – it is an unpredictable event – and the person who initiated it does not make any overt appeal or invitation to others in view of joining him. 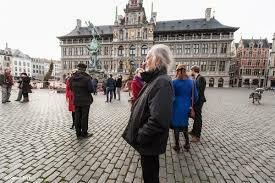 He merely puts an announcement on his Facebook page, saying that he’ll visit the Grand Place at, say, 6PM on Tuesday. Scores of others follow him each time. No law or regulation has been violated, while the city’s political and historical-architectural center is converted into a space of overt but unpunishable contestation. Such forms of creative, subversive and ludic interventions in public space are the stuff of this wonderfully edited collection of essays in which authors explore the purchase of central issues and concepts from the work of, mainly, Henri Lefebvre and David Harvey, with an occasional foray into the oeuvre of Engels, Bauer, Gramsci, Thompson, Soja and the Situationalists, in a joint (and largely successful) attempt to revive Marxist perspectives on “the urban” as a field of cultural production, of humanist freedom and of dis-alienation. The book suggests a preceding enthusiastic and engaging dialogue between its authors, which makes its contributions lively, sometimes riveting, and the collection compelling. Much is achieved in this book, and I can indulge in what follows in some thoughts and observations triggered by the studies in this volume. Before I do so, let me summarize the main intellectual line developed in the book and nicely sketched in Benjamin Fraser’s introductory chapter. The conceptual point of departure is Marx’s classic distinction between exchange value and use value – value within a market, and value outside the market, one could say. It was the genius of Lefebvre to apply this distinction to a political view of the city, which – in a critique of functionalist urbanists such as Corbusier – he saw increasingly becoming captured in a logic of exchange value. Cities were becoming, in the age of industrial capitalism, the locus where a giant workforce needed to be kept healthy, politically inert and fit for labor; cities were an instrument of capitalist power. 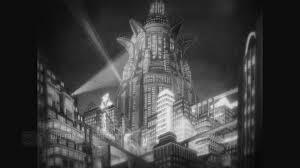 The post-industrial stage, in turn, saw cities converted into capital itself, with speculative real-estate exchange value dominating the logic of infrastructuring. Against this reality, Lefebvre pitted a concept of “l’urbain”, in which the city was not a mere built-up space or an exchange-valuable infrastructure, but a process of production driven by use-value. His “Le droit à la ville” (1968) codified this view: the city was, for him, a place where community life took place, consisting of an infinite multitude of ties between people, invested by interests but not driven by the quest for profit, but rather by the opportunities to achieve what Gortz later called “self-production”: becoming the homo faber whom the young Marx so passionately described in the Manuscripts. Achieving this level of humanity, for Lefebvre, was a fundamental right – hence “le droit à la ville”. This reconceptualization heralded an era of critical thought on urban spaces in scholarship as well as policy, and David Harvey did massive work identifying the tremendous critical potential lodged in this view. Needless to say that much of the politics of spatial contestation since 1968, with Occupy as its most recent articulation, has its roots in Lefebvre’s reconceptualization of “the urban”. Note, of course, that Lefebvre’s application of the Marxian distinction between different types of value to his view of “the urban”, eventually leads to a cultural bias. While modes of self-production have material dimensions, their outcomes are largely immaterial – a social ambiance which Lefebvre emphasized as necessarily “ludic”, playful, but of fundamental importance for achieving the humanity he saw as the ultimate aim of Marxism. The authors in this book are, thus, not off-mark when they engage with the ways in which cities have been depicted in movies, novels, or contemporary forms of carnivalesque demonstration. Note, at the same time, that Lefebvre’s Marxism was for precisely those reasons long considered as heterodox (hence, revisionist) “new left” by the non-Gramscian other half of Marxism. The authors in the book subscribe to this “new left” tendency – the book title says it all – and the range of authors from whom they draw inspiration, surveyed above, testifies to this. There is one exception: in an otherwise empirically stimulating paper on the Austromarxists’ dream of “Red Vienna”, Kimberly DeFazio sides with Engels’ conclusion that only a revolutionary change in fundamental economic relationships will solve the urban problem, dismissing en route any approach that does not accept revolutionary action as the sole means of transformation as un-Marxist. It is a pity that she passes the same verdict on people who never dismissed revolution as an aim and instrument of historical change but merely described the complex transformations of capital, labor and capitalist society – think of André Gortz and E.P. Thompson as cases in point. But let us return to the issue of the city. Lefebvre consistently stressed the importance of a “total science” of the city, decrying the ways in which institutionalized divisions between “social sciences” and “humanities” had become obstacles to holistic analyses of complex and dynamic phenomena such as cities and the patterns of human activity they involve. It is one of the achievements of this book that it manages to dissolve the distinction between what is “cultural” (hence, a matter for humanities) and what is “social” (hence, objects of social science). The cultural is fully social here, and even if we read chapters on eminently “humanities” objects such as novels or movies, the analysis demonstrates how such cultural objects are in no way “superstructural” – in a definition of the term that made it synonymous with “superficial” – but often the stuff that generates, sustains and determines crucial social processes of group and community formation, the articulation of sociopolitical and economic interests, the construction and ratification of identities, and so forth. Evidently, this folding of the cultural into the social generates a third sphere: the political. Here again, the intellectual lineage within Marxism is clear: Thompson, in most of his work, famously claimed that there is no proletariat without shared experiences of capitalist expropriation and exploitation converging onto structured patterns of what we would now call identities. The bourgeoisie, likewise, controlled its membership more by means of symbolic than hard capital – Bourdieu’s work, but also much of Erving Goffman’s, established that in great detail. It is this great detail that I wish to briefly engage with in what follows. The question of detail is not a question only of analytical accuracy, it is a conceptual and ontological issue that revolves around the locus of “culture” and of “the urban”. 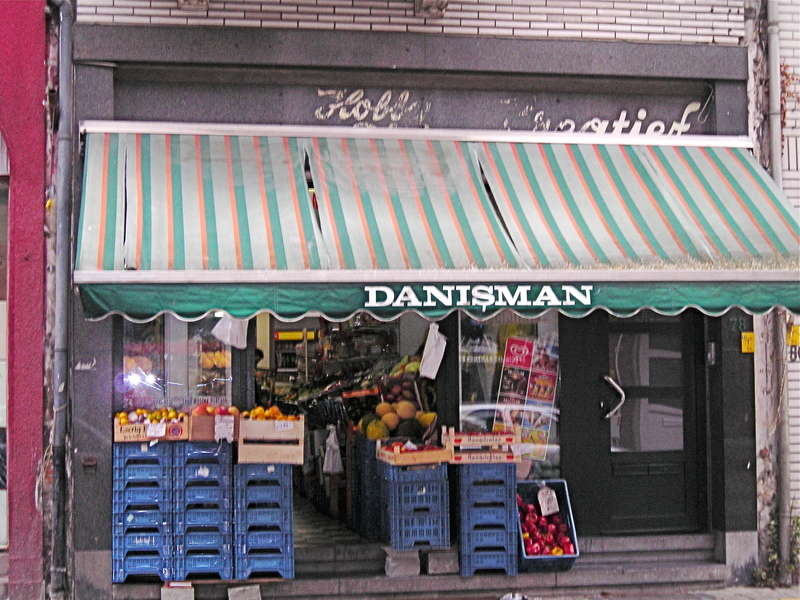 In the book, such loci are, to some extent, stereotyped: we see typically “urban” images in typically “cultural” objects such as movies, texts, architecture and forms of political carnival. 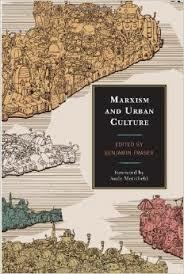 Thus “culture” and “the urban” are unproblematically clear in this book, so it seems. In actual fact, they are not. Let me start with the “cultural”. If the cultural equals the social (and thence, the political), then the locus of culture is the everyday re-enactment, over and over again, of socially patterned activities that are perceived to be meaningful by others (hence, driven by shared complexes of norms and expectations). It is this fundamental observation (and ontological principle) that propelled the likes of Herbert Blumer, Aaron Cicourel, Howard Becker and Erving Goffman to consider the micropolitics of everyday social practices, not because they considered the microscopic to be the privileged locus of whatever we understand by the term “society”, but because such micropractices are just not “micro”: they are effectively “macro” – the only realistic specter we can have on big things such as “society” or “culture”. “Culture”, thus, is not just lodged in a novel, a poem or a painting, but also in a routine greeting, a downcast gaze or a raised middle finger. And the experiential basis of “social” units such as class gains a clear empirical footing: whatever we call “social” rests on degrees of sharedness in recognizing what others do; or even more practically, in the ways in which we are able to make sense of social situations by means of such degrees of sharedness. Briefly returning to our “upstanding citizen” protests in Antwerp, we can see how such actions can be read, and understood as being politically meaningful, by reference only to locally valid cues about what counts as “demonstration” and what doesn’t count – insignificant actions become significant ones through the recognizable “frames” they articulate (at least, recognizable to some). I’m saying nothing new here – I merely reiterate the fundamental assumptions of Symbolic Interactionism. From a Marxist perspective, I find them quite productive, if for nothing else, because they compel us to turn a term such as “praxis” – often, to my profound frustration, used in a lapidary and loosely generalizing way – into an empirical program. Let us go out and look for those moments of practice that can be read, and dissected, as “praxis” and, as such, the ideology-infused moments in which “society” and “culture” enter reality. In my own work, I have attempted to take these principles into analyses of the actual, dense and complex semiotizations of urban spaces by their inhabitants and users by means of what is now called “linguistic landscapes”. People produce tremendous quantities of (what Benjamin Fraser, in the introductory chapter, calls) “Humanities texts” in the spaces they inhabit, turning them from mere space into social space (and thence, into politicized space); they do so by means of shop window signs, posters, banners, stickers, graffiti, post-its on window and doors, scribbled signs on the pavement and so forth. Such forms of semiotic activity, individually as well as collectively, lead us to insights into their histories of production and their potential uptake by selected audiences (no single sign is meant for everyone), and show us how space is demarcated into actual zones of ownership, legitimate usage and contested presence – by means of eminently “cultural” materials: written and designed messages communicating with specific addressees. They teach us that social and cultural spaces are spaces defined by real or virtual copresence (a feature central to Goffman’s work, of course) and, hence, by patterns of communication that do not offer themselves easily to a priori definition or a posteriori generalization. Attention to this level of praxis, thus, de-stereotypes the “cultural” and disperses it over a tremendous amount of everyday events and practices; it also destereotypes “the urban”, I would argue, for such forms of praxis occur in areas we typically define as urban as well as in areas seen as “peri-urban” or even “rural”. And they occur in tremendous multitude in that new space, often overlooked in current studies: the virtual space, which now crosscuts and connects “urban” as well as “non-urban” spaces in ways we still need to get our heads around, but of which we can assume that they render strict distinctions (and thus, definitions) of what is “urban” and what is not quite problematic. “Urban culture” – the term from the book title – may (and does) occur in phenomenally similar ways in spaces we would rarely call “urban”. And to the extent that Lefebvre’s “droit à la ville” concerned the fundamental right to a specific level of humanity, a disconnection between, on the one hand, “the urban” as the complex of rights to this kind of humanity and, on the other hand, the actual – stereotyped – cities known by names such as Mumbai, Paris or München might be necessary if we wish to preserve the fundamental humanist (and Marxist) sense attributed by Lefebvre to “l’urbain”. I make these remarks not as a targeted criticism of “Marxism and Urban Culture”; as I emphasized above, the book does a remarkable job in re-opening a field of inquiry in which I merely sketched some other lines and opportunities. The fact that I felt invited to do so testifies to the stimulating nature of the book: it engages one in an intellectual space of significant interest and relevance. The editor and the authors are to be credited for it. 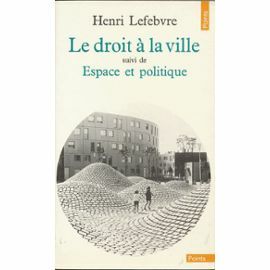 Henri Lefebvre, Le Droit à la Ville. Paris: Antropos 1968. André Gortz, Critique of Economic Reason. London: Verso 1989. For Marx’s humanism, see Erich Fromm, Marx’s view of Man. New York: Continuum 1961. Lefebvre’s view of Marxism is outlined in his concise “Que Sais-Je” booklet Le Marxisme (Paris: Presses universitaires de France 1958). An excellent discussion of the various developments within Marxism can be found in Eric Hobsbawm, How to Change the World. New haven: Yale University Press 2011. One can check E.P. Thompson’s Poverty of Theory for evidence (London: Merlin 1978). See for instance Pierre Bourdieu, Distinction. Cambridge MA: Harvard University Press 1984; Erving Goffman, Relations in Public. New York: Basic Books 1971. An entertaining and related study is Franco Moretti, The Bourgeois. London: Verso 2013. Two books in particular can be recommended: Herbert Blumer, Symbolic Interactionism: Perspective and Method. Berkeley: University of California Press/New York: Prentice Hall 1969. Aaron Cicourel, Cognitive Sociology. Harmondworth: Penguin Education 1972. Observe that Symbolic Interactionism has been an extraordinary but rarely discussed influence on Bourdieu’s work. For the latter, see Jan Blommaert, “Pierre Bourdieu and Language in Society”, Tilburg Papers in Culture Studies, paper 153, 2015. See e.g. Jan Blommaert, Ethnography, Superdiversity and Linguistic Landscapes: Chronicles of Complexity. Bristol: Multilingual Matters 2013.